Marine civil engineers Red 7 Marine have been building a new ferry lay over berthing facility in East Cowes, Isle of Wight, for the Ferry operator ‘Red Funnel’. 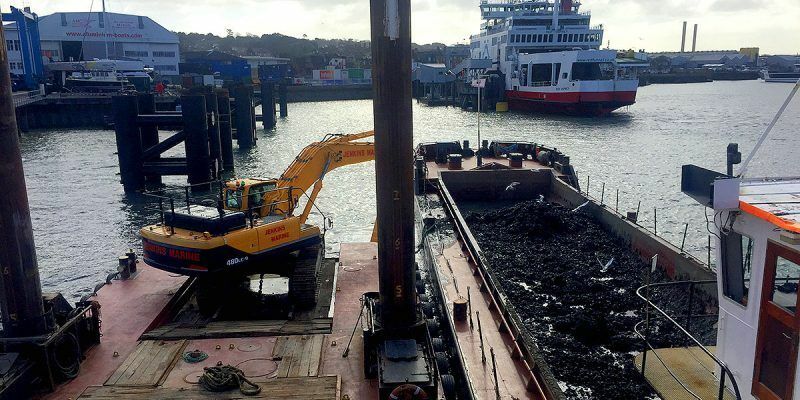 The project involved installing several mooring dolphins and mooring piles adjacent to the existing East Cowes ferry terminal for the new freight ferry ‘Red Kestrel’, due to be delivered very soon. 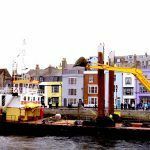 The project specification also necessitated dredging to ensure sufficient water depth for the new ferry, which marine dredging specialists Jenkins Marine were more than happy to complete. Contractors Red 7 have been busy on site with a variety of marine plant (including their Jack up barge) to complete the piling works which has restricted site access for the dredging. 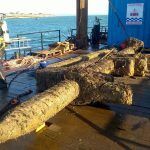 This, combined with the time limits imposed by the Marine License and an already busy dredging programme this winter for Jenkins Marine, created a considerable challenge. 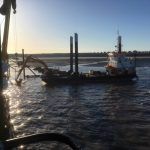 Backhoe dredger ‘Doreen Dorward’ and 300m3 capacity self-propelled split hopper barges ‘Nab’ and ‘Needles’ were used to complete the dredging works in March. Jenkins Marine were also able to assist the project by chartering an aluminium workboat to Red 7 Marine to facilitate access to their marine plant.